Jesus's words in John 17 represent one of the church's highest values "May they all be one as you and I Father are one". Yet divisions occur from the highest levels of the church to street level projects often neutralizing effectiveness and undercutting the credibility of Jesus's message. This book helps any believer turn the ideal of John 17 into reality. It provides solid grounding in the principles of partnership abundant case histories and empowering "how to" suggestions for lay person and ministry leader alike. 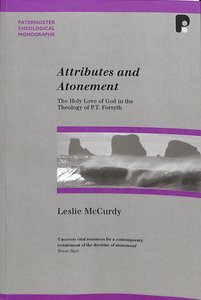 About "Attributes and Atonement: Holy Love of God in Theology of Pt Forsyth (Paternoster Biblical & Theological Monographs Series)"
Jesus's words in John 17 represent one of the church's highest values quot;May they all be one as you and I Father are one.quot; Yet divisions occur from the highest levels of the church to street level projects often neutralizing effectiveness and undercutting the credibility of Jesus's message. This book helps any believer turn the ideal of John 17 into reality. It provides solid grounding in the principles of partnership abundant case histories and empowering quot;how toquot; suggestions for lay person and ministry leader alike. Leslie McCurdy was ordained in 1979 and earned a PhD in Systematic Theology from the University of Aberdeen in 1994. He is currently Senior Pastor at Bayers Road United Baptist Church, Halifax, Nova Scotia and Adjunct Professor at Atlantic Baptist University, New Brunswick. This book argues that Paul's metaphorical language of death in Romans 6.1-11 conveys two aspects: horror and hope. The 'horror' aspect is conveyed by the 'crucifixion' language, and the 'hope' aspect by 'burial' language. The life of the Christian believer is understood, as relationship with sin is concerned ('death to sin'), between these two realities: horror and hope.